Ask a tattooist and a master of gold-leaf design to collaborate on a work of art themed "Zero Compromise," and what do you get? A gaudy gilded shrine to the late, great Ian "Lemmy" Kilmister of seminal metal band Motörhead, of course! 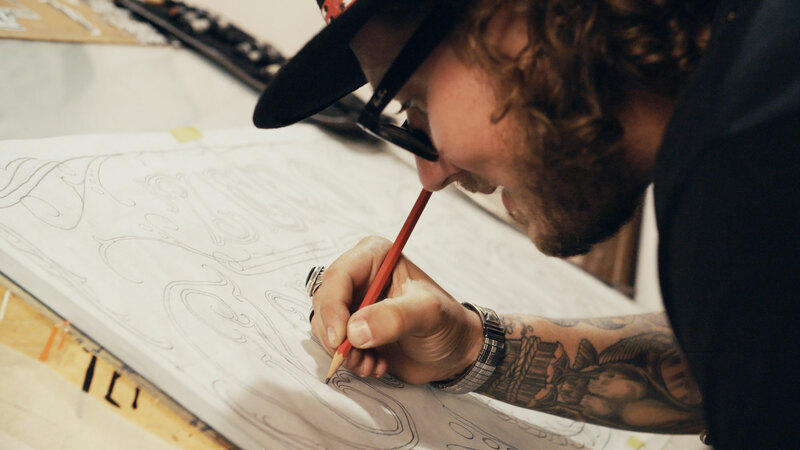 Robert Klem creates tats—and he's pretty hot with stained glass, too. Ken Davis sets the gold standard when it comes to ornate lettering. They're the first unlikely artistic duo challenged to "create something awesome together" by Adobe for its "Collabograms" campaign (a combo of collaboration and Instagram, the social focus here) touting the company's Photoshop product. "This series is about Photoshop supporting creativity and highlighting the incredible results that can come from unexpected pairings and collaboration," Lex van den Berghe, principle product manager of digital imaging at Adobe, tells Adweek. "The audience is what we like to call the New Creatives—artists who don't limit themselves to one medium, but pull from multiple influences and materials to express themselves." Klem and Davis certainly deliver on that score, crafting a weird and wonderful 10-foot-tall tribute to rock god Lemmy. (They chose the subject based on the "Zero Compromise" concept and their mutual love for the man's creativity and jovially profane style of joie de vivre.) The work features an impressive image of Lemmy rendered in stained glass (like a saint), votive candles, LED lights, Motörhead song references, shelves to leave offerings (pints seem appropriate)—plus a skull and dagger, naturally. "It's beautiful, but it's also metal as hell," van den Berghe says. "Lemmy's no-holds-barred approach to life resonated with both Ken and Klem, and they felt compelled to honor that spirit." Overt branding in the push, developed with Edelman, is extremely minimal—just the title card and closing Photoshop logo—and that really puts the spotlight on the artists and their work. "Every time I walk away from a collaborative experience, it definitely enriches me," Davis says at one point, pretty much summing up the enterprise. "This campaign was meant to shine on Instagram as a longer-form visual storytelling platform and a place where the Photoshop community is increasingly turning to for inspiration," says van den Berghe, by way of explaining the "Collabograms" tag and strong presence on that platform. "Our expanding new creative user is using Instagram as a way to infuse inspiration and networking into their everyday life." At least two more "Collabogram" videos featuring varied artists and subject matter will roll out in the coming months. In November, an illustrator and a culinary artist will present a piece based on the theme "Mermaids Taking Selfies." (Maybe they can work Lemmy into that one, too.) January's esoteric topic is "Scorpion/Duality," with an embroiderer and an iron worker set to collaborate. The physical nature of the collaborations is a bit at odds with digital tools like Photoshop as the brand sponsoring them. But van den Berghe says: "We loved the opportunity to deviate from the digital realm for a change and celebrate the idea that at the end of the day, all creative expression is beautiful and valid—whether it comes from a soldering iron, a gilding brush or a Photoshop brush." He praised Klem and Davis for producing something neither would have been able to make on their own. "They ended up working so well together, and their art meshed together so perfectly, that it winds up not seeming strange at all. Which is exactly what we hoped for." Turns out the video shoot went less smoothly. "When we were getting all of Klem's interviews, we set up the recording gear in his shop and just as we began interviewing him while he worked on the stained glass piece of Lemmy, the air filled with the loud banging and booming of Taiko drumming," van den Berghe says. "There was an international music festival half a block away, and a full-day schedule of amplified music on deck. We recorded the interview in short, rapid-fire bursts between songs and sets. Lemmy would've loved that this project was nearly derailed by amplified music—the Taiko drums and didgeridoos, though, maybe not so much."